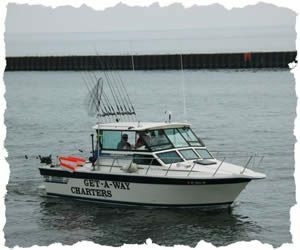 The “Get-A-Way” is a 28 foot twin engine Baha Cruiser. She is a full service charter boat, inspected by the United States Coast Guard annually for your safety and pleasure. She is fully insured and equipped with the most sate-of-the-art electronic equipment available. She has a comfortable cabin and private head. Plenty of fish fighting area on the rear deck. Click here to book a charter. We expect our customers to ask questions, learn our techniques, and be an involved part of the fish catching team. The captain will do his best to teach you in one day things that have taken him years to perfect. This is what makes his customers happy and satisfied. The Captain is licensed by the United States Coast Guard, is Red Cross first aid certified and CPR trained.